Work begins Friday on the west side of the access route between the National Park and Kalapana along the historic Chain of Craters Road. Work begins Friday, October 24 on the west side of the emergency access route between Hawai‘i Volcanoes National Park and Kalapana along the historic Chain of Craters Road. The half-mile section of paved road that pedestrians use to access the lava that covered it in 2003 will be closed as of Friday. The historic flows and coastal area alongside the construction will also be closed. 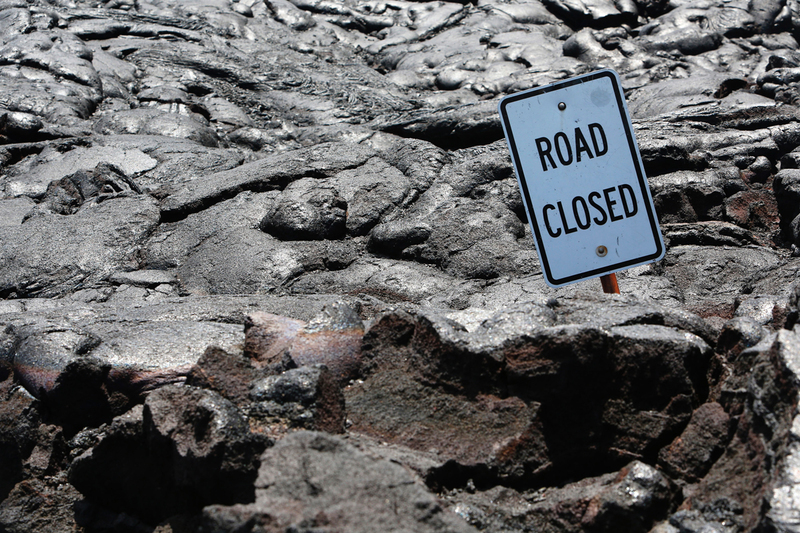 The National Park service says the popular “Road Closed” sign enrobed in lava will be removed to become part of park history. Hōlei Sea Arch, the turnaround, bathrooms, and concession stand near the turnaround will remain open. Motorists can expect traffic delays early Thursday and Friday mornings as large bulldozers and heavy equipment are transported from the summit of Kīlauea down the 19-mile stretch of Chain of Craters Road to the turnaround. “We intend to reopen the closed area as soon as it is safe to do so and the bulldozers move closer to Kalapana,” said Park Superintendent Cindy Orlando. “But now is the time to take those last photos of the iconic ‘Road Closed’ sign before it is removed on Friday,” she said. Last week, bulldozers from the Kalapana side graded the 2.2-mile portion of Highway 130 covered in lava to where it meets the park boundary and becomes Chain of Craters Road. This week, crews start to grade the 5.4 miles through the park to the Kalapana boundary. The work is being done by the County of Hawai‘i, and overseen by the National Park Service and Federal Highways Administration. Opened in 1965, Chain of Craters Road has been covered and blocked by lava for 37 years of its 49-year existence.